Banksy visited San Francisco about five years ago and left a few works on various walls, all but two gone now, so i figured i’d better go out and get shots of those while they lasted. Actually, the one that was on the wall of the Red Victorian on Haight Street has been removed and preserved. Some folks carefully pried the siding off the wall and reassembled/restored it in the 836M gallery, where you can view it in the front window, not that it’s possible to get a good photo of it through the glass, and you can’t see it from inside the gallery, so you’ll have to click on the above link. Sigh. 836M sounds like an exciting place, but as best i can tell does not keep regular hours and was closed when i went by. 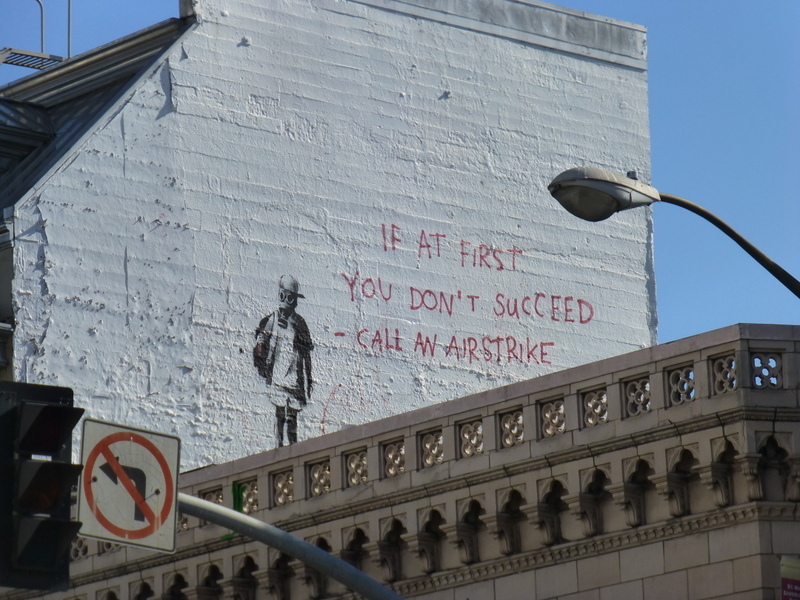 The other remaining Banksy is just three blocks away at the corner of Broadway and Columbus but is difficult to photograph if you didn’t arrive by helicopter. I really do have to get myself a drone with a remote controlled camera for occasions like this. Still, here it is from in front of the Condor. Banksy has come up with some other memorable lines, e.g., “You Are an Acceptable Level of Threat and If You Were Not You Would Know About It”.